"Who should I vote for? JB, Kennedy, Biss? No one impressed me at the WBEZ debate." I blinked at the question. Messages firehose at me all the time—on Facebook, Twitter and email, now a distant third, nearly occupying the tenuous position that letters written in blunt pencil on blue lined notebook paper once held. But this was coming in over iPhone Messenger, from somebody with my phone number. In the next line, he ID'ed himself. My old college roommate. Ah. As a professional journalist, I couldn't summarize the 2018 primary election more eloquently than he did in 16 words. Then again, he was a political science major. Months of increasingly wild accusations, millions and millions spent on grim, black-and-white TV commercials and what are we left with? A sulfurous smell hanging in the air and three not-so-appealing choices. I'm not certain which of these guys to vote for and I've had long conversations with each. The opening question is telling. It assumes, as I do above, that the only election of interest is the Democratic primary. That's true. (I was tempted to tease my friend with, "Aren't you a Republican by now?" But that seemed cruel). Compared to the Democratic slugfest, the Republican primary has been a muted sideshow. Or make that, freak show, starring Jeanne Ives in a tent off the midway, a lady tattooed head-to-toe with vile and shameful appeals to the bottom rung of the Republican Party, using every racist code in the book short of semaphore flag: Immigrants are murderers. Transgender people are predators. Who can blame anybody for tuning out this Punch and Judy show? I prefer to experience the election as a civilian, primarily through the relentless TV and radio commercials. Pritzker scored points early by swinging hard for Obamacare enrollment, his money stepping in for the delinquent Trump administration firing back at Trump's immigration slanders.The idea of a rebel stronghold in Illinois, based on emergent state power and the bottomless Pritzker fortune, is something I could get behind. To continue reading, click here. I find the choice in the Democratic primary for governor easy. We currently have a billionaire governor who had absolutely no experience in government & that shows because he's been totally incompetent! So obviously, Pritzker is out as he's a billionaire Democrat with the same lack of experience as the current Republican numbskull..
Then we come to Dan Biss, who's dumber than a box of rocks! Because Biss, a Jew, not only picked as his running mate a Chicago alderman, a group not noted for their smarts [other than maybe three or four of them], but he managed to pick the one alderman who turned out to be a flat out anti-Semite. That's some vetting process you did there Dan. So that leaves me with Chris Kennedy, who has some experience & appears to be a thoughtful guy with some brains. He's certainly not perfect, but he'll drive Rauner nuts all the way to November. As for the Republicans, they have a disaster on their hands. Rauner is a total failure as governor & his one credible challenger is a right-wing loon, who if she's the nominee, will challenge Alan Keyes for getting the least votes in a major election! Bravo on the Godzilla vs Rodan reference Sir. Not sure which is in greater decline, the quality of the candidates or the intelligence of the voters. Since Chris Kennedy took my sister and coworkers to Hyannisport which resulted in a great story for JFK democrats, he got my vote. Also I suspect that his deficiencies as a campaigner are no indication of his qualification for the position. Whatever, the next vote will truly be a no brainer. After 25 years in Ohio, I still miss Chicago, but I definitely do not miss living in Illinois. Yeah, yeah, I know...we have my former Congressman, Dennis Kucinich, seeking the nomination for governor. Try not to laugh too hard at us. 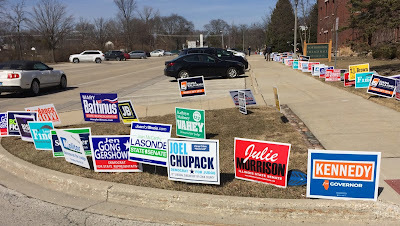 There's a perplexing no-win situation out in the suburbs, too. 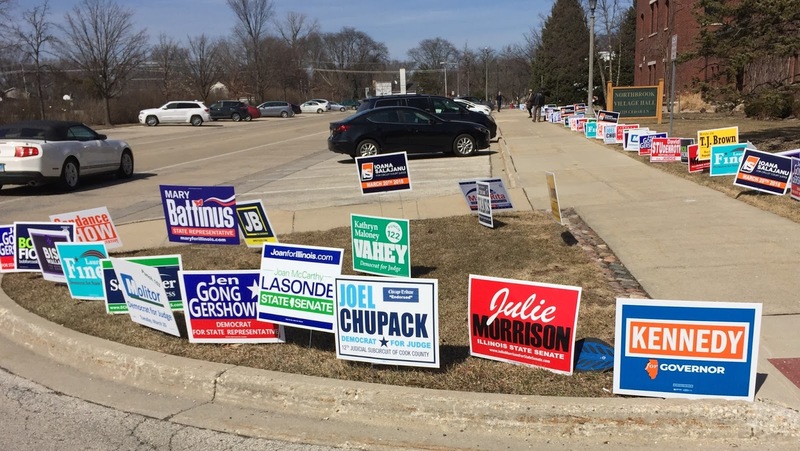 What kind of school district would be dumb enough to have a bond issue on the ballot with signs out stating that voting yes will help make the schools safe and secure, and then a week before the vote give more than 1,000 students detentions for joining a peaceful protest against gun violence? That would be High School District 99 in Downers Grove, detention champions of America. Props 2 the poster above 4 the handle Mr. Creosote: "Eeets waf-fer thin!..." Last night, as I read this column on the S-T website, there were a half-dozen ads featuring Pritzker that kept eyeing me as I scrolled down the page. Checking again just now, there was only one. Progress! I voted today. It's the longest that I ever waited to vote early. A few weeks ago I thought I knew who I would vote for. That changed. As I walked in to the polling place, I still hadn't decided. As I sat in front of the monitor, I still didn't know who to vote for. I ended up voting for the candidate that I had chosen a few weeks ago, but I didn't feel good about it. In the past I've always felt good after voting. Today was different. Maybe if we get big money out of the process, the waters won't be so muddied. At least youse guys are still living in a blue state. Here in Ahia, a recent poll asked voters if they'd still pick Gov. John Kasich over His Orangeness, which they did in the 2016 primary by a margin of 47-36. This time around, Kasich lost the hypothetical rematch, 62-27. For a long time, I've been calling my adopted home state "North Missitucky." Suddenly, it ain't all that amusin' anymore. Back when Facebook was new, to me. What's with tomato soup and grilled cheese? "Each unhappy in its own way"